How My Favorite Covert Got Its Name. A fine brace of sharptails from the Royal Macnab. All hunters have observed that it’s Nature’s way for game to typically be scarce. Some years, bird populations are better than others, but sometimes― like right now―birds are just hard to find, which makes those times where we find an abundance all that more special. Every bird hunter has a covert or two where they experienced some of the best hunting they can recall and bird numbers were beyond all expectations. And while the phenomenon of that day may never be quite replicated, those special days afield and the covert become imprinted on our psyche and emblazoned on our souls. Every year, my brother Shawn and I get together for our annual week-long hunt in the Idaho uplands. No offense meant to our Muslim friends, but we call this week, the “Holy Jihad on the Gallinations” because we hunt all over southern Idaho for multiple species of bird. To say that we look forward to this time together all year long is an understatement. As Mark C. Dilts so aptly stated in the Introduction to Of Grouse and Things: “A grouse hunter’s year is said to be divided into two distinct parts; one is grouse season and the other ain’t!” In 2003, we planned our week of hunting in October when all of creation was in its full splendor and grouse season was most definitely in. Along for this hunt was Shawn, our younger brother Jacob, and me. 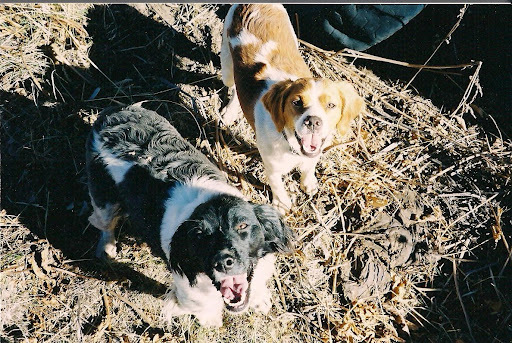 Having lost Farley just before the hunting season, I only had my French Brittany, Sunny Girl, Jake had Sunny’s sister, Halley, and Shawn had two Elhew Pointers, Geppedo and Dusty, and an English Setter, Ginny. Halley and Sunny. Believe it or not, these two are French Brittany sisters. As we drove towards our destination in the dark, Shawn told me about Robert “Bob” F. Jone’s story, “The Royal Macbob,” which is based upon the British sporting feat of catching an Atlantic Salmon, shooting a red stag, and bagging a brace of grouse all in one day. When this is accomplished, it is called, “The Great Macnab.” And if a sportsman threw in some hanky panky with a member of the landowner’s household, it was called, “The Royal Macnab.” Anyway, Shawn explained that Jones liked the challenge so much he changed it up to meet his circumstances. For him the feat was to: (1) shoot a deer with his bow; (2) catch a brook trout on the fly; (3) shoot a brace of ruffed grouse; and (4) throw in some hanky panky with his wife all in one day. He dubbed his impressive feat: “The Royal Macbob.” We all laughed as Shawn described Jones’s classic take on this theme while the sun began to peak over the big range to the east. “Wow brother, this looks like textbook sharptail habitat!” Shawn observed while we geared up for the hunt. “Yep, after reading Western Wings by Ben O. Williams, I knew the first instant I saw this place that it fit the bill. We should see some birds.” I replied, not knowing what an understatement I had just made. This incomparable covert is comprised primarily of CRP fields that slope gently downhill. However, the hand of time has gouged through the rolling CRP fields numerous parallel draws running east to west which have drained the area for eons. As the draws slope downhill to the west, they become increasingly deeper and wider to the point where they become more like canyons. Inside, the draws are lined with quaking aspens and numerous berry bushes, including service berry, rose hips, and elder berry, which serve as food sources for all the game birds, including ruffed grouse, Hungarian Partridge, pheasant, and sharptail. Above the CRP fields to the east are grand, steep mountains with thick pine forests. To sum it up, the surrounding panorama is simply breathtaking. As we hiked the rolling hills at first light, we witnessed a phenomenon that I have only witnessed this one time. That morning there were so many sharptails in this covert, that we could literally hear them clucking everywhere. It sounded like chickens in a coup sans a crowing rooster. Immediately, I had the thought: This is going to be a banner day! 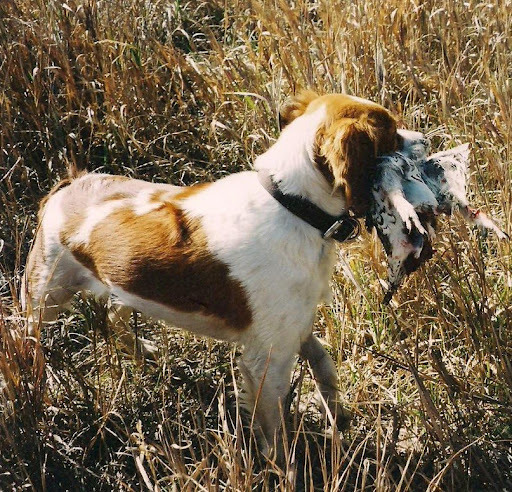 Shawn’s dog Dusty took note, went bezerk, and embarked (no pun intended) on a bird-bustin’ rampage flushing every sharptail within a hundred yards. Of course, Shawn shouted some angry expletives, while Jake and I strained to keep our mouths shut. It was this very performance that resulted in Dusty being dubbed, “Bustin’ Dusty” for the rest of his days. And to think, I later took Dusty in as my own dog in hopes of a reformation, but unfortunately―while I grew to love the knucklehead―the moniker stuck for the rest of his life. Despite Dusty’s shenanigans, there were still plenty of birds for us to find. In fact, as we hunted south, we heard shots from across a big draw on an adjacent property and watched another huge covey of sharptails flee the other hunters’ pursuit and drop down into our vicinity to replenish what Dusty had just flushed to the horizon. We all smiled at our good fortune. It truly was one of those charmed days! 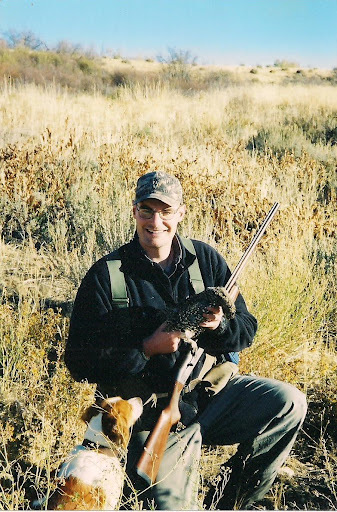 One special memory that stands out for me occurred when we dropped down a draw on the edge of the property and kicked up a grouse that flushed uphill giving me a quartering away shot, which I made. Little Sunny Girl, who with the loss of Farley, was hunting solo for me, went in for the retrieve and by golly, the darn bird got up again presenting a close left to right crossing shot, which I connected on again. Not back to back singles, but I’ll take it. One-year-old Sunny made her very first retrieve to hand. I snapped a picture to commemorate the accomplishment. Sunny is now 9 years old and has been a solid retriever ever since. Apparently, this day was a seminal one for the dogs as well. Sunny Girl’s very first retrieve. When the action slowed and our bellies growled with hunger, we decided to head into town for some Mexican food (of course) and try a totally different spot that afternoon. Andy proudly displays Sunny’s first retrieve. “That sounds good to me!” I responded. The hunting had been so good that morning that he did not have to twist my arm. That afternoon, my brother-in-law, Eric, and nephew Josh, met up with us at our new favorite covert and we all commenced hunting. Again, this special place was loaded with sharptails. After a few of us filled our two-bird limits, our goal was to get the newcomers, Eric and Josh, into some birds. Try as we may, we just could not get those boys into position for a good shot. Then finally, one bird lit down into bottom of a wooded draw and I marked it down perfectly. 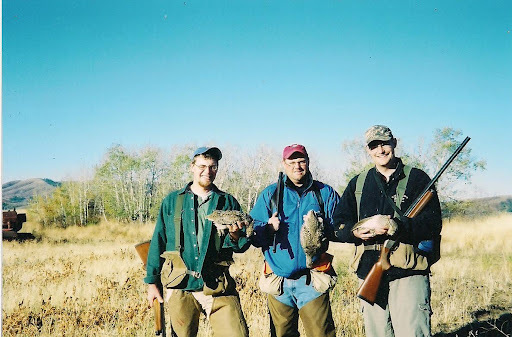 With my limit filled, I told Josh and Eric, “Come with me, I know right where that bird landed.” The two eager beavers obediently followed their guide. 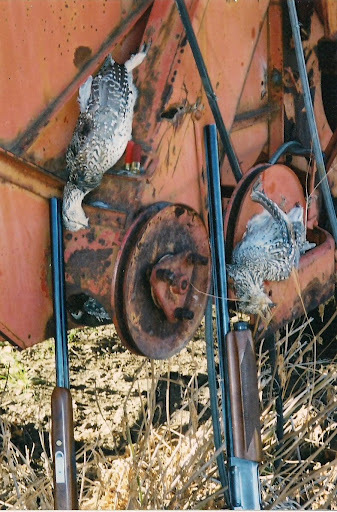 At the bottom of the draw in the tall weeds, I said, “All right boys, that bird is right down here, get ready!” I could not have given them a better set up. As if on cue, the sharpie flushed straightaway giving them what looked like an easy chip shot, which Eric and Josh saluted numerous times on its way out of Dodge. Of course, with a chuckle, I razzed them for their inexplicable misses. In their defense, Hemingway said something about fishing, which I think applies equally to shotgunning: “Somebody just back of you while you are [shooting] is a bad as someone looking over your shoulder while you write a letter to your girl.” Simply put, the pressure was on and they both choked (like most of us have, or would have, in the same situation). As we drove away from this unparalleled covert after such a stellar day, we reflected on the days events. Shawn stated, “A special covert like this needs a kingly name. From now on, this place is ‘The Royal Macnab.’” The consensus was quick and unanimous. We named the covert in honor of that classic story written by Robert F. Jones, which to this day, is still one of our all-time favorites in sporting literature. After starting off this day with a good laugh over Jone’s classic story, the name just seemed to fit. Left to Right: Brothers Jake, Shawn and Andy on their first day together at the Royal Macnab. Since then, every day in The Royal Macnab has been special, but none more unforgettable than the first from whence it got its name. Come every October 1st, I know exactly where I want to be when the sun peaks over the mountains to the east. Good memories for sure! Great Prose too! Great story. We have a place kind of like that in Kansas where we hunt ring necks. We really got after them on our first trip in this CRP field that we named "The Honey Hole". We have never killed 'em like we did on that first trip, but the name still sticks! Thanks for aharing! Fantastic story. I'm contemplating changing my last name to Wayment in a hope to hunt in this magical spot. This is a great story and a great blog. I wish I'd found it sooner. Andy, Thank you for helping me find a new life goal. I want to complete my own “Royal Macbob”. I am fortunate to live down the road from some conservation lands which you can get a hunting permit for and have plenty of deer, grouse, stocked pheasants and the river below the dam has brown trout. So next season and every season there after until I complete this feat I think I will aspire to this grand slam. So glad to hear Paul. I have a feat I call the Royal Flush at my covert, The Outhouse. The goal is to shoot a blue, a Ruff and catch a cutty on the fly all in the same day. I’ve pulled it off a few times. I don’t hunt deer very often so I haven’t tried to throw that in the mix, although that would be fun.